Experience the Radio City Christmas Spectacular with the Rockettes from your orchestra seat and enjoy this one-of-a-kind holiday celebration. The Christmas Spectacular shines at Radio City Music Hall. Only the world's largest indoor theatre could host the most spectacular Christmas celebration. The Christmas Spectacular is a glittering present full of delightful surprises for the whole family. 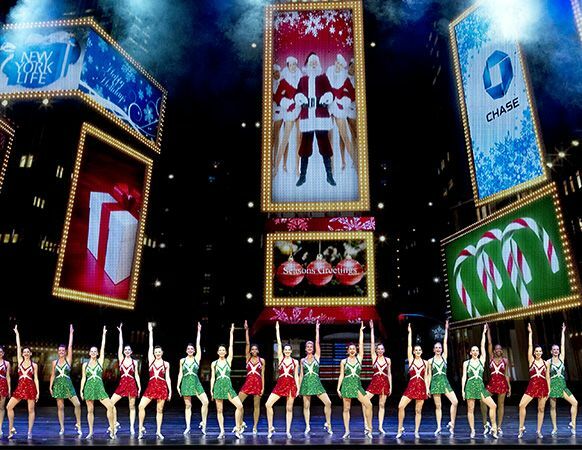 With the legendary Rockettes, stunning reenactments of the first Christmas, and brilliant costumes and sets, it's a timeless one-of-a-kind celebration to share with family and friends. No one does it better than the Radio City Christmas Spectacular! All seats are Orchestra for this fabulous annual event! If you purchase this meal card, you will be responsible for getting to Planet Hollywood and back from the Music Hall. It's a short walk (about 8 blocks). -Rockefeller Center Christmas Tree will be lit on Wednesday night, 11/28/18 (subject to change). The running time for each show is 90 minutes, with no intermission. The following is a recap of showtimes, etc. -At the Music Hall, there are wheelchair accessible restrooms on all levels as well as elevators to the Mezzanine levels.